*Any students interviewed had their name kept anonymous. The direct quotes used in the article represent the views of the student, not the publication staff or adviser. 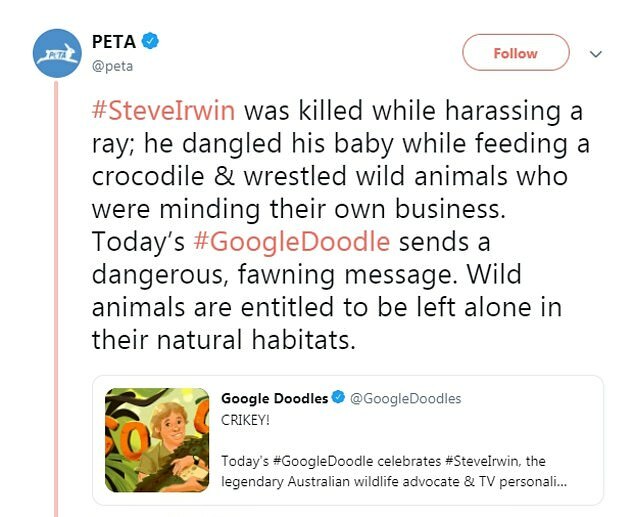 A little over a week ago, the animal advocacy group PETA (People for the Ethical Treatment of Animals) tweeted a message condemning search engine Google for its usage of Steve Irwin, “The Crocodile Hunter”, as its Google Doodle for Irwin’s 57th birthday. 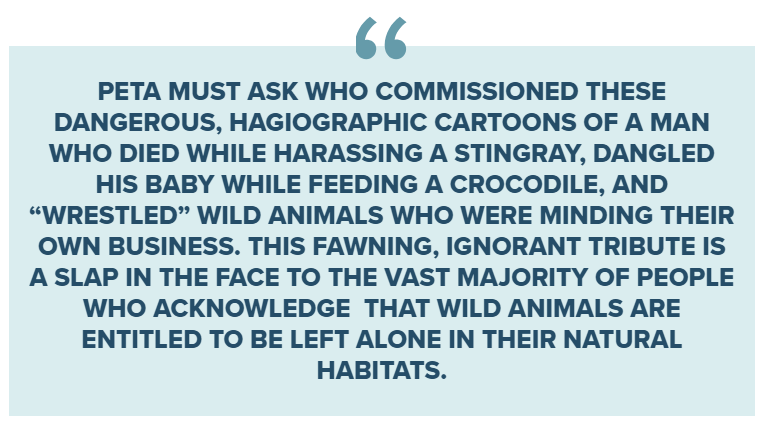 The tweet lambasted Irwin for harassing a ray, dangling his baby while feeding a crocodile, and wrestling wild animals, and Google for sending a “dangerous, fawning message” to its users. Founded back in March 1980 by animal rights activists’ Ingrid Newkirk and Alex Pacheco, PETA has become the largest nonprofit animal rights organization. With more than 6.5 million members worldwide, PETA aims to spread its mission statement of saving animals. In the 39 years of its existence, the animal rights organization has campaigned and protested for the humane treatment of animals. Its core beliefs include “opposition to factory farming, fur farming, animal testing, and the use of animals in entertainment”. In addition to those core beliefs, it advocates for a vegan lifestyle. After the Silver Spring monkeys case, which involved the inhumane experimentation of 17 monkeys at a research center in Maryland, the organization began to gain traction around the world. Although PETA campaigns for the humane treatment of animals, many often criticize the organization’s extreme marketing tactics. Some of the extreme marketing campaigned by PETA can be noticed when they’ve compared the killing of chickens to the Holocaust and having models lay out on the street packaged as “human meat”. Another source of public criticism comes from its practice of neutering and euthanization of animals it takes in. From that tweet, a controversy arose among the public. The controversy sparked a huge backlash against the animal rights organization. People against the organization labeled PETA as “insensitive” and “disrespectful”. Even wildlife conservationist Anneka Svenska opposed PETA’s view on Irwin, telling BBC Radio 1 that Irwin “has inspired the next generation of conservationists”. In response to the criticism, PETA later released an official statement. PETA’s official statement continued to condemn Irwin for his actions. In addition, the official statement released by PETA did not include an official apology. Due to no official apology, PETA continued to anger the public. PETA’s official statement in response to criticism received from the Steve Irwin tweet. At Cain, while PETA’s influence may not seem apparent, a few students believe in PETA’s core beliefs. The student also voiced their opinions on the Steve Irwin tweet. As a PETA 2 member, the student wants everyone to look beyond the extreme things PETA does for its cause.